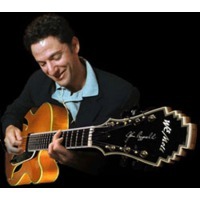 John Paul Pizzarelli, Jr. (born April 6, 1960) is an American jazz guitarist, vocalist, songwriter and bandleader. He has had a lengthy career as a recording artist, performing for a variety of labels that include Telarc Records, RCA Records and Chesky Records, among others. He has recorded twenty-three albums of his own, as well as other joint recordings with his father, Bucky Pizzarelli. Additionally, he has appeared on more than forty albums of other recording artists, including those of James Taylor, Rosemary Clooney and his wife, Jessica Molaskey.